Brought up in Aberdare in the Cynon Valley, Dale is the youngest of four children. Having completed secondary education, he moved to Swansea where he worked in Retail Management and read Medieval History at Swansea University. Speaking of his application to the Diocese, Dale says, “applying to be considered for formation to the Priesthood was undoubtedly the most terrifying experience of my life; something I had flatly rejected being a possibility a few years ago. I converted to Catholicism in 2006. My parents, themselves sharing mixed backgrounds in Christianity, chose not to impose any particular religious tradition upon my siblings or myself, choosing to allow us to make our own decisions. At around 14, I felt a strong call from God to follow and know him. After attending some services within several denominations of Christianity, I found myself settling into the parish of St Joseph’s, Aberdare. Within two years, I completed the RCIA programme and was received into the Church at Easter, 2006. The idea of Priesthood was never an obvious one to me. I slowly began to feel another calling from God to do ‘something’ in 2014. In the summer of 2015, during a placement in Westminster Cathedral, I realised in prayer before Holy Mass that God was asking me to offer myself to Mother Church for formation to the Priesthood. In all honesty, I wept… for quite some time. I first contacted Fr. Paul Millar regarding discernment of my vocation in early 2016. Since then, I have had a phenomenal amount of support and guidance from His Grace Archbishop George Stack, Rev. Fr. 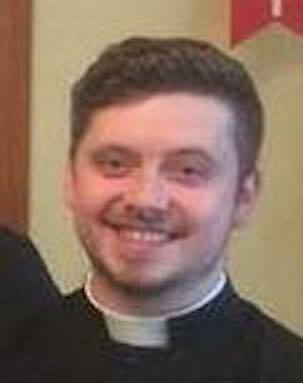 Paul Millar, Rev. Fr. Canon Matthew Jones, as well as all of the Seminarians. I can’t thank them enough for their support and guidance, and the opportunity that has been offered to me to develop my relationship with Christ. In my short time within the fold of the Diocese, I have found countless inspiring examples of people and communities seeking to be closer to Christ. To those who are wondering the ‘if’ and the ‘maybe’ of following Christ I simply ask to trust him. Yes it is terrifying… but it will lead you, and others, to joy.